Everyone knows Dow Jones Index and S&P 500 Index, but often not VIX. So what is VIX and why is it good to know? The VIX Volatility Index, also known as the “fear index”, is the implied volatility for the S&P 500 index for U.S. large-cap stocks. When the market is in turmoil, VIX goes up. You can see this clearly from the chart below. “Wait a second… don’t people say high-risk high-return?” Nice catch! When comparing different asset classes (such as stocks and bonds) over the long run, high-risk high-return tends to hold true. But when looking at a specific asset class, say, U.S. stock market, it is quite often the opposite. Now let’s zoom into the first half of 2018. 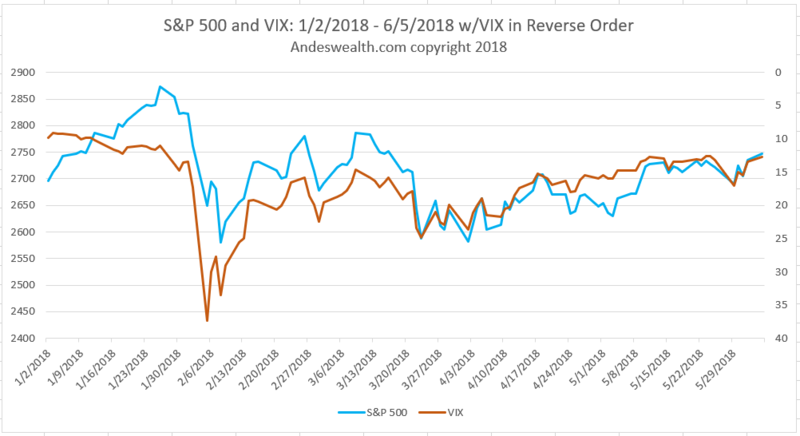 The S&P 500 and VIX are almost like the mirror image of each other. To see the pattern better, I plotted VIX in reverse. What an incredible match! “Then why do we need to look at VIX if it usually goes in the opposite direction?” A good question indeed. While the pattern is often true, it is not always the case, thus VIX can give you an additional clue. In 2016 and 2017, there were a lot of talks about a possible crash. But the VIX at the time was remarkably low. If you were paranoid enough, checking VIX every day should have given you the confidence at least for the day. See blog Is The Next Crash Coming? (Jan 29, 2018). People were caught by surprise on Feb 5, 2018, but there was actually a clear sign in the week of 1/29/2018 – 2/2/2018, when the VIX climbed steadily from 11 to 17.3 in a week, which was a real concern. In the aftermath of Feb 5, 2018, VIX once again provided additional insights. It is like someone recovering from a fever. While you may still feel weak, you know you are getting better if the fever has subsided. Over the last 30 years, the volatility of the U.S. stock market is around 17. During the 2007-2008 financial crisis, VIX reached 89.53 on October 24, 2008. Volatility was remarkably low throughout 2017, often hovering around 10. It is worth noting that the VIX index is the 30-day forward-looking implied volatility based on observed market prices for options, not the actual volatility of S&P 500. But it is good enough as a proxy that people usually don’t bother to split hair. ← Feb 5, 2018: I Contributed to History, Did You?